We are delighted to announce that the Craft Guild of Chefs will be designing and producing the meal for the Gala Dinner at the 2019 ceda Conference! For the last three years, the leading chefs’ association have prepared the dinner for our Thursday evening meal at the annual ceda event and it has always been well received by the attendees of the informal networking dinner. It started as a way of demonstrating our collaboration with other industry bodies and associations and has blossomed into an annual occurrence. This year, in a break with tradition, the Craft Guild of Chefs are designing and creating the menu for the Friday night Gala Dinner & Grand Prix Awards – headed up by chef Alan Paton. 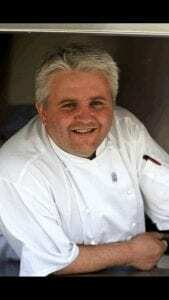 Alan is a well-known figure in the industry and an active committee member of the Craft Guild of Chefs and of The Master Chefs of Great Britain and works with Springboard Futurechef. Using his 30 plus years of experience he loves mentoring and bringing on the next generation of chefs. Outside of this he runs his own chef consultant company Paton & Co.
Alan has been involved with the preparation of the Thursday night dinner at the ceda Conference for the last four years. This year he will lead a team made up of James Carn, Michael Eyre, Tracy Pereira and Matt Wilby.